Though most are busy scheduling, activities, vacation, and other fun during the summer months, few realize the impact the summer has on carpets. Once you know how the summer is likely to negatively effect, you can avoid or minimize the deterioration it has. We at Go Green Carpet Cleaning & Restoration would like to share the problems summer can have on the carpet. 1) Allergens, Beetles, Bugs & Pests on Carpet. Summer seasonal allergies are on the rise and running rapid and insects are at their most activities. Allergens are easily introduced into homes through the central air system, brought in on shoes and pets and other such methods. Insects can also easily come indoors on a variety ways. Change the air filters regularly, keep the lawn, shrubs, and trees trimmed and pruned away from the house, and daily vacuuming can collect the majority of the allergens and insects. These few little things can help reduce the pests and allergens. 2) Sun Faded Carpet Damage. The carpet’s color fades with the sunlight, especially when it has direct contact. During the summer months, the sun is more intense, which only expedites the effects the UV deterioration and color fading that results in the carpets looking dull and lifeless. This is gradual process isn’t always noticeable until homeowners move around furniture and see the comparison. Move the furniture around periodically to even out the sun exposure. Invest in window treatments such as UV films curtains, drapes, and/or blinds to cover up the direct contact of the sun to help prevent the fading and the UV damage. 3) Heavy Foot Traffic. Whether you got the grandkids over more frequently or your own kids home for the summer, the carpets are going to experience the additional foot traffic. Extra visitors are also likely during the summer and with more foot traffic come more dirt and debris along with normal abuse from walking to and fro and the activities kids do. It if it isn’t under control, the carpets can quickly appear rough. Daily vacuuming to control the dirt and debris is optimal. Be sure to place outdoor walk-off mats at the regularly used entry points and sweep them off as often as needed. Enforce the “no shoes worn on carpet” rule and have an indoor rug at the entry door to help contain the dirt. 4) Bacteria, Mildew, and Mold Growth on Carpet. Mildew, mold, and other bacteria typically require warmth and moisture to take seed and flourish; just what summer brings. With the warm temperatures of the summer months and the moisture produced from kids playing in the pool, sprinkler use, summer storms, or even excess humid day, the mold and mildew spores that are likely on the carpet can easily blossom. Where mold especially prefers darkness, it will even grow rapidly under the carpet, where you won’t realize it is there until the damage is done. To avoid the potential mold, mildew, and other forms of bacteria growing in your carpets, utilize dehumidifiers where applicable. If the kids indulge in water games make sure they are dry before making contacting with the carpet. Ensure the windows and doors are shut tight during summer rain storms. Should excess water/liquid make contact with your carpets, promptly dry the area with a clean, dry towel. With the help of Go Green Carpet Cleaning & Restoration comprehensive carpet cleaning services, we can extract the dirt and other soil, any insect and eggs, stains, odors, as well as disinfect the carpets from potential mold and bacteria to help prevent the summer abuse from occurring on your carpets in addition to your efforts. Call us to schedule your carpet cleaning service! Hardwood floors provide a comfortable warm homey feeling to a room. Floors are shiny and provide years of utility. The downside is that the finish will eventually dull, and marks will develop from furniture and everyday use and traffic. The good news is that these floors can be refinished and brought to a like new surface and shine. When Does a Hardwood Floor Need Refinishing? Refinishing will only work on flooring retaining their full integrity. Broken, split or other damages will have to be addressed prior to the refinish and restoration. This is usually done by replacing the damaged pieces. For professional refinishing, you will want to engage a certified professional contractor. After ensuring that all repairs have been done, the contractor will begin sanding the floor using the different grit sandpaper rolls on a machine designed for floors. We will start with a course grit to knock down the distressed surface and remove any surface marks or stains. Then we will progress to a medium grit to a final fine grit for a smooth open grain surface to accept the stain and surface coatings. Water Based VS Acid Cured Finishes – Most finishes are water-based polyurethane and there are acid cured finishes. The water-based products are economical and user friendly but less durable. Acid cured finishes are very durable but are the most difficult to apply and can be dangerous if not handled properly. 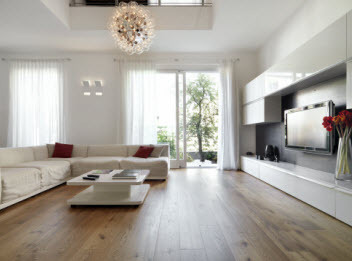 Water-based polyurethane is the hands down most popular finish in the world of hardwood floors. Oil based polyurethane is another option, though it may ‘yellow’ over time. Oil Sealers – An oil sealer doesn’t dry as hard as polyurethane but penetrates deeper bringing out the wood grain and enhances the natural wood color. It is low gloss producing a natural look ideal for older or traditional style homes. Primarily Tung oil, a natural product it will need to be reapplied ever three to five years and this product needs 24 to 48 hours to dry. Hard-wax Oil, though outdated to some, is easy to apply but the least durable of the finishes considered so far and must be reapplied every 2-3 years. Acid Cured or Swedish Finish – Acid-cured or Swedish finish are the most durable finish of all, even better than polyurethane. Smooth textured or exotic woods necessitate acid curing finishes. However, during drying and curing process acid cured finishes are highly toxic the drying time lasts from 3 to 30 days. Aluminum Oxide Finish – Aluminum Oxide is the king of wood finishes as to durability. This finish can last up to 25 years, great for engineered flooring products but is only available on prefinished products and not adaptable to refinishing. High quality finishes need only two coats while the less quality finishes may require three or more coats to complete the job. The primary consideration whether it is a DIY or contracted project is patience. A day to sand. First coat then let stand to dry and cure for 8 hours, then the second coat with another 8 hours before final buffing. You’re looking at about three days for the complete job, maybe two for a smaller room. Patience is a virtue when refinishing hardwood floors. Refinishing hardwood floors is a major undertaking and your time and skill level will need to be considered, some projects are best left to the pros. Go Green Carpet Cleaning & Restoration offers hardwood floor installation, refinishing and cleaning among our other quality flooring and upholstery cleaning. Contact us today. Does your family just not feel complete? One way to complete a family and make your house a home is to bring home a four legged pet. A dog is a great way to bring a loving and loyal member to the house. There are several benefits to having a dog in the home. They have a natural defense for a would be intruder. When someone knocks on the door they are sure to start barking alerting the intruder that they might want to move on. They also are a good way to get health. They need to be taken out for a walk often which means you are going to be out more as well. The dog also is a great companion for all the members of the family and can give them some love and affection. They are a great addition to your house but can also bring with them some messes as well. 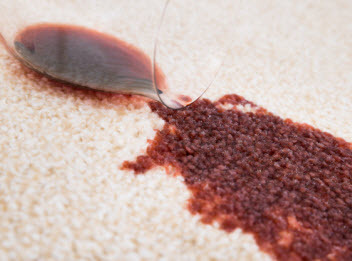 You want to be sure that you have a plan to treat and clean the stains and spots they are sure to get on your carpets. Dog Urine & Feces Carpet Stains: Bringing a new puppy home is such a joy for a family. Everyone gathers around and enjoys loving and calling the new puppy to crawl on their lap. The problem is that a new puppy has to then be trained where they are supposed to go to use the bathroom. If you have a dog door they are able to find the door and go out when they need. Some have to learn how to alert the owner that they need a bathroom break. During this learning process you will be stuck cleaning up urine and feces off the carpet. The biggest issue that you are going to deal with is the urine stains also leaves odor behind as well. The urine soaks in the carpet and has to be neutralized to get it out. Mud, Dirt & Grass Carpet Stains: Now that the dog has learned how to use the bathroom and what they need to do get outdoors you need to be aware of what they are bringing in. The dog will head out to the yard and run around the rocks, dirt and grass while they search for the perfect spot to use the bathroom. When they come running back in the house their paws are covered with mud, dirt and grass that then ends up on your carpets. They are not able to wipe off their feet so you want to be ready to clean these types of messes and stains. Dog Hair & Dander in Carpet: The fluffier the puppy the cuter they seem to be. What you need to consider is how much hair you want to clean off your couches and carpet. Dogs are usually going to have a shedding problem twice in a year and smaller shedding the rest of the year. The hair can end up all over the house and that is why you want to be sure that you stay on top of cleaning the hair and dander from your couches and carpets as often as possible. Go Green Carpet Cleaning & Restoration can come out to your house and take care of all your dog messes, stains and spots from your carpet. Call us today! When a homeowner wants to spruce up a room with a splash of color they have several options. They can use artwork or throw pillows. Another option they have is to use an area rug. They come in all shapes, sizes, colors and patterns which means you can find something that will fit your home. They are a great addition to a room and can bring in some fun and color to any space. They also have an added benefit to a room in the way of protection. The rug is a great line of defense and will prevent damage to the floor underneath. The rug can be laid on any type of flooring including carpet and other hard floors such as tile and hardwood. Even though an area rug is a great option for a home you need to know what to do to take care of them. You want to make sure that they are clean just like your other flooring. Area Rug Stain Removal: One of the biggest problems you might come across when you have area rugs are stains! It seems like no matter how hard you try to keep liquids and other foods off the carpet and rugs there is always spills. When you have a spill on your area rugs it is important to have them cleaned right away. The spill can end up being a stain that might be difficult to treat and remove. The reason that your area rugs will end up being spilled on is because they are covering the other flooring option and protecting it from that same spill. You want to have your area rugs cleaned professionally to be sure that any and all stains are treated and removed. Area Rugs Trap Dust Mites & Allergens: Do you have people in your home that struggle with allergies and asthma? These are very common ailments that people suffer from and all it takes is a trigger to have them suffering. Your area rugs are full of allergens that could be acting as a trigger for your allergies and asthma. The allergens that are on your rugs are usually dust mites, dust particles, hair, fur, dander and more. These can all be removed from the rugs when you have them cleaned by a professional carpet cleaning company. Area Rugs Hold Dirt: Most people will use the vacuum to remove the dirt that is on their carpets and rugs. Dirt is brought in the house on your person as well as your pets and through open doors and windows. That dirt can be tracked on the carpets and the area rugs. When you allow the dirt to sit on the rugs it can act like sandpaper rubbing against the carpet fibers damaging them. It is best to have your area rug vacuumed and cleaned professionally to get the deep set dirt. Go Green Carpet Cleaning & Restoration has the ability to get your area rugs clean. Give us a call to make an appointment.